The current Triumph Bonneville is a nice retro with a punchy 865 cc parallel-twin engine that was essentially developed more than a decade ago. We enjoyed the Bonneville during our last test of the model, but the engine might be considered nothing more than adequate by today’s standards. Apparently, Triumph is doing something about that. A new line of water-cooled retros is expected to debut this Fall, including an 1100 cc version of the parallel-twin powering the top-of-the-line models. 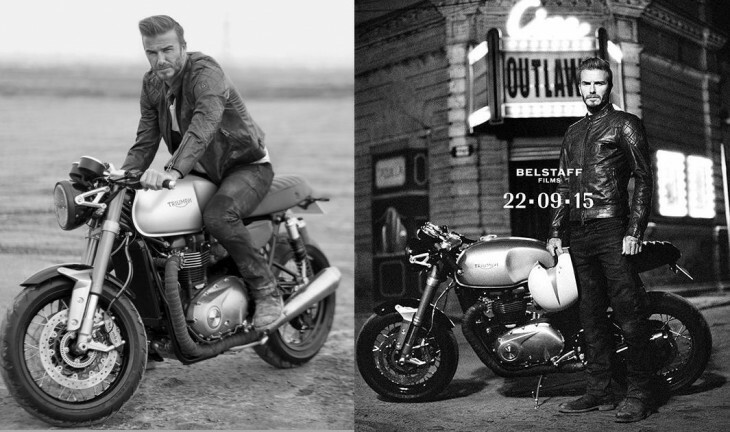 Reportedly, one of those 1100 cc Bonneville’s is ridden by soccer legend David Beckham in an upcoming movie titled “Outlaws”, which is sponsored by the Belstaff Clothing Company. Promotional images from the movie are floating around, including the two composited above. The film debuts in two weeks time. You will note from the images upside-down forks and Brembo radial-mount calipers. This is not the sort of kit you find on any current stock Triumph Bonneville. We suspect the low Cafe style bars are just one option Triumph will offer, together with a more standard ergonomic package. The new 1100 is reportedly a ripper. Stay tuned. This is going to be an awesome bike. It’s essentially what the custom world has been doing to Bonnevilles for years. Triumph have been paying attention. From other pictures I’ve seen, I think the rear wheel / sprocket looks a bit cluttered compared to the front, but that can be fixed. I can’t wait to see this in the flesh. I’d be more inclined to purchase if the adverts featured Posh rather then Becks. Actually if I’m being truthful I’d rather they featured Mel B. Can someone enlighten me on the reasoning behind the exhausts being wrapped / insulated as shown in the promo pics ? For the same reason these “outlaws” are wearing the motorcycle gear equivalent of Gucci: fashion. I remember reading somewhere that exhaust wrap was used originally in race cars back in the day to help manage the temperature in the engine bay. The tape also destroyed the headers which is why ceramic-type coatings were eventually developed for auto headers. While I doubt a street bike’s headers get hot enough to destroy themselves within the heat tape, it certainly serves no purpose whatsoever save for maybe a rider trying to keep excessive heat off of his/her leg. The race engines fared well, it was the street engines that had the problems. Street engines didn’t get the exhaust hot enough so the tape collected condensation and rotted the pipes away. When I see header wrap it doesn’t make me think of racing, it reminds me of stupid fashion trends gone bad. Race car teams fared well because they replaced the headers after each race. I’ve seen a few street bikes with wrapped headers, and condensation certainly isn’t an issue with them. They definitely get hot enough to bake water out. One guy I’ve known for a long time started wrapping the pipe on his dual sport years ago because he got tired of burning a hole in his riding pants. He re-wraps it every year because it looks like total garbage after a year of dual sport riding, but six years later that cheap, mild steel pipe is just fine. And it sees a lot of mud and water. The saving grace in his case may just be that he rides it often enough to bake all of the moisture out. Or maybe all the horror stories we read about header wrap are more urban legend that fact. I can’t say for sure either way, but I don’t remember reading a first-hand account or seeing a single youtube video of a header on a street bike application destroyed by the ill-effects of header wrap. I’m sure I could dig up some first-hand accounts if I looked hard enough, but all the evils of header wrap I’ve come across so far are the result of hearsay. Googling the subject didn’t locate the (probably 20-year-old) article I was referring to, but it did return a pretty interesting snippet from Kevin Cameron and another from Century Performance if you are interested. I view header wrap as mostly fashion, in a sort of torn and frayed jeans, scuffed leather jacket sort of way. I seem to remember the early turbo motors sometimes wrapped in order to hold in all the heat energy for the turbo? More boost pressure? I do recall it being used to control under hood temps. Didn’t read all the comments so forgive me if someone already said this, but the bike pictured reminds me of the new Nortons. I agree with the fellow who loves the W800, wish they sold them stateside. That said, this new big boy bonnie will be a lot faster than the Kawi and most other retros. I can hear the duh’s now. PS. Everyone should learn in the dirt. If you knew how bad the company was you would never buy a Triumph, shrinking dealer network, a totally socialist company. Its so sad because it use not to be like that. Stay away from them. A “socialist” company? What does that mean? Did they undermine the US voting process to get Obama elected? Are they out to get me in some way? Not out to get you, only if you bought a Triumph. Now i have to drive 100 miles to get the thing serviced and if i change my own oil i cannot reset the service lite unless i see a dealer, dealer went out of business because of to many requirements to stay a dealer, there rules are to control the dealer, thats not the american way. Oh my honda dealer is still in business. I certainly understand some of the bitterness you may have if you’ve been left high and dry.. And I hate those silly service indicator lights that can’t be reset without a special tool. In all fairness, all OEMs place pretty stiff requirements on their dealers. If you think Triumph is bad, talk to a BMW or KTM dealer. You want something called DelaerTool for your Triumph that will allow you some basic interfaces with the ECU to read / clear trouble codes and reset you service interval light. I don’t remember what it costs, but it was less than $100. “…a totally socialist company.” “It use [used] to not be like that.” — What? After Triumph went into liquidation in 1983, it was rescued by John Bloor, who bought the name and manufacturing rights, and is the sole owner of the company. I’m sure he’d get a kick out of knowing his is “a socialist company.” I sometimes fear that Dirck’s wonderful website is attracting some of the more-typical internet trolls seen elsewhere. When it was not like that i mean in 1998 to 2010, dealers popping up every where, dealers where happy to sell the stuff and now discount prices and dealers disappearing, mine check out and said Triumph could stick it, How did it get like that, i am the one left holding the bag[Triumph], i am trading it when its paid for. Yes, OK, my dealer folded, too, but in his case, he never put anything back into his business. The building itself looked like it was about to crumble, and I’d bet Triumph was quite happy to see him go. I’ve found an independent service place nearby who just performed my valve adjustments, and I’m satisfied. As far as rules pertaining to dealers, that isn’t necessarily bad for customers – unless the dealer refuses to comply and closes, of course. And, as Jeremy mentioned, BMW is even harder on dealers; that certainly isn’t hurting their sales. It doesn’t look like much. I’d prefer Kawasaki bringing back the W 650/800. I ride a W800 every day to and from work. I rode a 69 650 Bonnie for years, the handling was light and responsive, the brakes were rubbish and the rebuilds / upgrades “formative”. This planned 1200 Bonnie has some nice minimalist / clean styling – be interesting to see if Triumph can keep the weight and complexity / cost down …. Looking at this bike, aside from the engine configuration I wouldn’t say that the biggest influence was a previous Triumph, but instead a Ducati – the GT1000. I also thought it looked very much like the GT1000. Both images were taken by Belstaff for promotion purposes. MCN apparently put a watermark on the left image, but that doesn’t mean it owns rights to Belstaff’s photo. Noticed you fixed it, good job. A big liquid coold engine would go nicely in the Bonneville America. Can they just bring back the Thunderbird Sport (triple) with 100hp? An 1100cc, liquid-cooled Bonneville makes the idea of a Thunderbird Sport superfluous, anymore. I’ve read that the lightweight Street Triple, however, might be due for a boost to 800cc soon. I just like the triples much better than the twins, they feel right and sound amazing. I know they won’t build another retro triple but I can dream. A retro styled triple would be nice. I loved my old Thunderbird triple, still miss it. Don’t miss the maintenance issues I had with it however. I’d daresay these are becoming collectible. The ones that pop up for sale in AU (which they rarely do) are generally asking for more than their original retail prices – on par with the Ducati Sport Classic series. I bought a ThunderBird Sport new in 1999, and still ride it with 96,500 miles on the clock. With Wilcox Racing cams, pods, ignitech igniter, nology coils, TOR pipes, it is really pretty exciting. Also have a 2013 Bonneville with some mods as well. Bonnie is fun little bike, but NOTHING like the TBS. Agree a modern TBS with the 1050 triple like in my Sprint would be the ticket. I don’t understand what a Thunderbird Sport would give you that a Speed Triple wouldn’t? It wouldn’t look like a Speed Triple. Looks promising. Anxious to learn more about it. These 865’s are very tame out of the box. Curing the milk toastiness with a massive bump of displacement (and probably weight) is one way to go, but would rather them keep the size down and work on making it lighter and tuned with sporty bias. Recover some of the old 650’s rorty-snorty attitude. I agree. I sure hope they don’t ruin the charm of the T-100 or eliminate it altogether. When exactly did David Beckham become a soccer “legend”? Moved to the soccer forum. Well, I can’t say if he is a “legend” or not, but he is the only footballer I can name. And I am not exaggerating. I am trying to think of someone else, but I can’t. When it comes to soccer in the US, name recognition is probably enough to qualify as “soccer legend”. Oh, come on. What about Pele? You’ve heard of him right? Us Americans know soccer! I’d bet my left turn signal that the “Outlaws” movie, sponsored by a clothing company, will be an embarrassment to all motorcyclists. So, ten years from now this 1100 will be merely adequate by 2025 standards when Triumph debuts its 2400cc entry level Bonneville. This shyte is getting stupid. There is absolutely nothing inadequate about the 865. The 865 is adequate. Adequate is adequate but not exciting. Getting stupid? Do you think this bike is going to make 150hp or something? We are probably looking at an 80 – 90 hp bike. Nothing stupid about that. The 1000cc to 1200cc street bike has been around for decades now. This isn’t new, just new for the Bonneville line. The current Bonnie is lacking an exciting level of power (in stock form), but I’ve ridden mine for 5 years, now, and it’s the first bike I’ve been happy to own for more than 1 – 2 years. It’s just easy to live with, after the most basic seat, suspension and f.i. mapping/exhaust upgrades. I would, however, be very grateful for maybe another 20% (or more!) urge. True. I think the current Bonnies are great bikes for the intended purpose. IMO, the only thing they need that can’t be remedied is a sixth gear. I’m with you. A sixth gear, lighten the crank and flywheel to liven up the delivery. I’ve found riding Ducatis and Beemers it’s not so much the power but the delivery and where the power is located. I’d like to see around 90 with wheel lightening snappy response. I’ve been riding an 1100 Hyper lately and it’s a hoot! They could do similar with this twin without a radiator and without me having to split the cases. I rented a T-100 out in LA for a week a couple years ago. I really fell in love with that bike. It worked great everywhere I went including riding two-up. However, I was constantly asking for sixth gear out on the highway. That was the only real flaw I could find. I own an 1100 Hyper as well and will likely keep it until I can no longer ride it. I can’t think of a bike that is more fun and they are deceptively quick in a short burst. Definitely requires some maturity and self control! I, took, often find myself wishing for a 6th gear, but then see the tach at 4,000 rpm, which is not unreasonable at all for 70mph, and remember the bike was designed for British “B” roads – our county roads – and feel OK with the 5-speed’s nicely-spaced ratios. Right? If there was a sixth gear people would complain that you need to downshift to pass. What would a sixth gear give you other than a different exhaust note on the highway? I don’t think vibration is the issue. The Rocket III has a 2.3 Liter Lump you can buy today….and since mid 2000’s???? I really like it. Classic looks, modern bits… Can’t wait to see more details on it. Those forks and brakes go a long way to divert attention from the radiator! Haha, yes those are some tasty bits out in front of that radiator. Personally, I really don’t have a problem with radiators. To some it is blasphemy. To me, it is just reality. I think they did a good job with the air-liquid hybrid cooling to keep the radiator small enough that it doesn’t detract from the overall look of the bike. But that’s just me. Factory pipe wrap? I’d be real surprised. That riding position looks horrid for a standard, if I have to sit like that id prefer a race bike. Some are so committed to the look, they will ride the 2 miles down to the pub in a full race crouch. …in full Elvis Presly era leathers and pudding bowl helmet! Its the Hipster Dress-Up Game for Grown men. The bike and the outfit go together. Don’t for get the Hand Made “Gasolina” Motorcycle Boots – Midnight Edition for me. These boots are so cool, its almost worth getting a Modern-Classic Motrocycle…. No one said that bike in the photo is a “standard.” I’d imagine, like the current model line, the next Bonneville will be offered in a number of different styles, with a new Thruxton, Scrambler, T-100, etc. could somebody ask the model to get the fK outa the way……? Nice to see that Triumph is updating the Bonneville. Weird, I know, but I have no complaints about that. I know it says “Triumph” but it looks a lot like that Norton 961 + a radiator..
A liquid cooled Bonneville? That’s not a Bonneville. No thanks. Yeah, I agree. Keep that line simple and elemental. Air cooled. It’s not a speed triple for cryin out loud. Luckily for all y’all… you can buy a few current Bonnevilles now, keep one in the crate for future use and enjoy the other one for the next 10 years. Emission regs, mate. Killed the air-cooled Duc Monsters too. And turned it into a scrambler? So you’re saying hipsters are bigger than environmental bodies? I can believe that. Nothing like having forks and brakes that are stiffer/more powerful than the frame was designed for. It will be a 2017 model to coincide with the new emission standards. Will Outlaws be an actual film? Or will it be a one of those commercials disguised as a movie? Advertising is so slick these days. Monkey see monkey do. I’m going to go out on a limb and guess Belstaff Clothing can’t exactly afford to produce an “actual” film for the sake of artistic expression. That made me grin. Thanks for the laugh. The Hyo GTR650GZR would run CIRCLES around this Triumph… Just Check it! Bring it on! It would embarrass the Rocket3, too… just Smash it! I’d only consider this an advancement of the Bonneville’s if it lost some weight. The typical buyer never cared much about the power output. I think a less expensive, smaller displacement Bonneville will be in the lineup for 2016. Will that one come with baby Beckham? Not that I want one but, hey. Perhaps it will come with Victoria Beckham. You might want it then. I really hope so. I would like to see a new retro 750 or 650 and well under 400 pounds. Riders and manufacturers have lost their minds when it comes to beginner bikes. Many claim that beginner bikes include 600cc motorcycles that make about 70% more horsepower than the MV Agusta 500 triple on which Giacomo Agostini won seven consecutive GP500 championships (1966-1972). My first motorcycle (not minibike) was a Honda 90cc (model CA200). I graduated to a Suzuki TS125, then a Yamaha DT175, and then a Honda XL-500R before moving to multi-cylinder bikes. Learning on *actual* entry-level bikes probably has a lot to do with why I’m neither dead nor crippled after more than four decades of riding. The new Sub-400cc Entry-Level Sportbike class is a good sign that that manufacturers are starting to wake up. Beyond size though, I think that learning on dirt and trail also adds skills that many riders today don’t have. Like what to do when the front pushes on loose sand, wet leaves or gravel. +1 What the heck, plus 100! I am convinced that learning to ride and ride well off-road never hurt one’s riding skills on pavement…except watching out for the other guy perhaps! Starting on the Dirt teaches the basic skills, it is fun, and WHEN you fall (not IF) you will get hurt, hopefully not serious, but hurt enough to KNOW the seriousness of riding and crashing on the street! Statistics have proven you right, RD350; learning to ride off-road strongly correlates with reduced on-road accidents. I rode that old Honda 90cc street bike almost completely off-road (I was too young to have a license). The bikes that followed were ridden off-road and the TS-125 had been stripped of all lights, so it was off-road only. Glad that you’re still with us and learned on bikes that made you discover how to get the most out of them without them getting everything out of you. I’ve come pretty much full circle after 50+ years of riding and wouldn’t mind having a CA200 “Baby Benly” or maybe a CA201 (look it up) in my collection. This new Bonneville should be more like its original namesake and provide more than just entry level performance and maybe a good balance for experienced riders to appreciate. I think the spy photos of the new models are looking a lot better than the previous gen Triumph twins. I learned on a zx-11, they all come with a throttle, if the rider is dumb enough to ignore that they will find another way to die young. You’re mistaking judgment and skill for luck. When you got on that bike, you didn’t have the throttle control, riding skill, or reflexes to control a motorcycle with that much power or weight. If you put 100 beginning drivers in a 500hp AC Cobra replica, some percentage of them will get lucky and celebrate their next birthday — and they will probably be telling us all how the 500hp AC Cobra was a great car to learn in and how it’s a testament to their judgment and skill. If they make an 1100 Scrambler I’ll be a very happy man. A scrambler is supposed to be a small, lightweight bike with modest horsepower. Asking for an 1100cc Scrambler is like asking for a 250 pound Victoria’s Secret lingerie model. The current scrambler is already more of a Lane Bryant model. I’d rather not ride either of them. I would expect a modest increase in power but a decent x-tra punch of the good stuff down low. Can only spin those motors so tight!